We’ve all been there. We’ve all seen the look on the face of a young athlete as they sits on the end of the bench, just waiting to get called to go into the game. Whether you’re a coach, director, parent, or fan, that’s a hard scene to watch. Youth athletics are about learning the game, sharing in the competitive spirit, and learning about teamwork. It’s idealistic to expect every child to get to enjoy this process equally. Unfortunately, not every young athlete will get equal playing time as they progress through youth athletics. Here are our tips on ways to help young athletes cope with lack of playing time. It’s important for coaches and league directors to be aware of the mentality of young athletes. For some youth, their identity is tied to athletics. “Between 12, 13, 14, things become competitive. Coaches ought to know a lot of times these young people, their identities are tied to their sports – they’re a football player or a basketball player,” said Dr. Justin Anderson, a sports psychologist at Premier Sport Psychology. If a player is struggling with a sport, it could cause them to question their identity. If they only see themselves as a soccer, hockey, or baseball player who is getting limited playing time, they could begin to question who they are and what they are good at. Knowing the mentality of youth athletes will help coaches and directors determine how to approach the subject of playing time with young players. It’s important for leagues to treat players as people first and athletes second. This will help the players realize they are good at more than sports and that their playing time doesn’t reflect who they are as a person. Checkout these tips on how to keep a positive youth sports culture! One way coaches and directors can head off issues surrounding playing time is to set expectations at the beginning of the season. Coaches and directors should make it clear how playing time is decided – based on talent, how much effort in practice, overall attendance, attitude, and/or team chemistry. 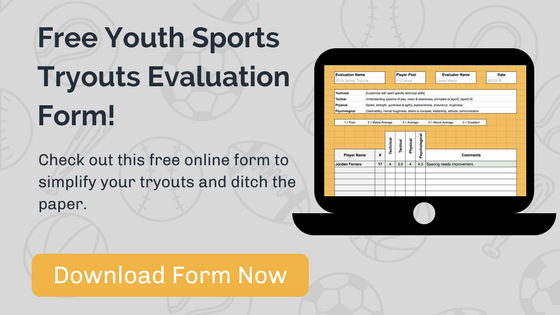 This will not only set clear expectations, but it will also establish that an athlete’s sheer level of talent is not the only thing that will determine playing time. This can help motivate athletes to practice harder, focus on improving specific skills, and come to practice and games with a good attitude. Another way to help young athletes cope with lack of playing time is for coaches and directors to be open with athletes about why they are not getting a lot of playing time. This will allow them to help the player understand the areas they need to improve. This is the coach’s chance to have an honest conversation with the player on what skills need to be improved in order see more game action. If there is a behavioral issue, this is the coach’s opportunity to explain to the athlete how attitude affects playing time. It may help to refer to your code of conduct for this conversation as well. It’s also important for coaches and directors to give athletes a heads up if their playing time is going to change. If an athlete goes from starting to riding the bench, the youth is likely to be confused as to what he or she did to result in the change. To help cope with lack of playing time, explain the reasons to them. It might be that certain players play well together and have chemistry on the court, and therefore he or she will see less playing time. If that’s the case, then the player should be informed before the change takes place so the circumstances can be understood. If there has been a drop in effort or focus, addressing it with the player will help the athlete understand why attitude is important and how he or she can improve to restore their playing time. Taking playing time away from a young athlete is never a fun task for any coach or director. It’s even less fun for the athlete. Being open with young players about their playing time, and stating what they need to do to restore their game-time participation, will benefit youth athletes.